Almost the worst film ever. 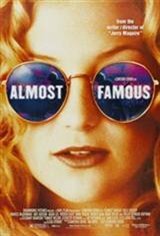 Another terrible movie from hack sentimentalist Cameron Crowe. Garbage. My favourite movie of all time! I watch it at least twice a week and have done so since I discovered it four years ago :) I know every line and it never gets old ! I thought that it was a great rock & roll movie & it was very o funny.All the actors were great but Patrick Fugit & Kate Hudsen were my favourite! One Of The Best Movies Ive Ever Seen. One of the best movies of all time. Proud to own it on DVD. Billy Crudup rocks a walk through a dream of being as close to touring with a band in the 70,s as possible !!! I can relate to this movie like no other. just wish I was a better wrighter to express my love for this film. Beautifully written. You could almost feel the main characters beside you. A real testimonial to beautiful music and the role it plays in our lives.